Take two at filling this in with the whole commentary as for some reason the original disappeared Wednesday night/Thursday morning. I have been itching to do a star trail picture for a long while and on Monday night decided to head out to Rougham Control Tower (Google Map) on a cold frosty night with aching stomach. 1. Camera firmly mounted on a weighted tripod. With a hot shoe spirit level ensured the camera was horizontally level. With a compass and locating the great bear ensured that camera was pointing due north towards the pole star (to obtain the circle of stars). 4. Then I sat on my Karrimat with hot coffee and listened to the latest from Scott and the crew on TWiP on the iPod whilst I watched the frost build up on the grass and the stars whiz over. 5. 10 minutes in and a Muntjac deer came barrelling through a hedge and across the grass till it bounced off the tripod and me. So after some cursing, realignment and brushing myself down, I started again. 6. After the 100 initial exposures, the camera was set to f8 and focus to hyperfocal distance so that I can take one image where I light painted the control tower with a 3W LED torch (using day light white balance appeared accurate whilst giving a gentle glow to the background light in the distance). 7. Finally 1 last image was taken with the lens cap on as a dark frame for later noise assessment during post processing. 8. So after 102 images, feeling very cold and the imodium wearing off, I headed back home after completing the tedious part. 1. This could have been done by loading the stack of images into Photoshop and use "lighten" blending but the memory requirement would have been horrific with full size 12.3MP camera images. 2. Instead I used an application called Startrails to do the blending. The 100 normal images plus the light painted one was selected for the blending and the single dark frame one. As noise wasn't too bad for the camera a single dark frame was ok. Otherwise 3 dark frame could be used taken every 33 images just in case there is any variance. The images where blended and the result saved as a TIFF. The application can do a video of the star movement but didn't seemed to work on any of my Vista PCs. Update: Looked again at using Photoshop CS3 Extended to do the merge of all 101 pictures (not including the dark frame). Easiest method is to use the Analysis script in the file menu, then browse and add all the images you wish to include, set the analysis method to "Maximum" and away you go. Let the PC chug away and after over an hour you end up with a 22GB temporary Photoshop file and a very large smart object which you should then flatten to a layer for final tweaking. Comparing the results, the Photoshop version was a little cleaner but Startrails only took 5 minutes to produce the combined images with little memory and temporary file overheads. However if a few number of much longer exposures was used then I'd probably recommend the Photoshop Analysis script approach. Used in TradeKing Big Dog blog's blog article Friday Community shout-out!. Featured in Digital Photography Schools blog articleLong Exposure Photography: 15 Stunning Examples. Reported in Curious? Read's article Long Exposure Photography: 15 Stunning Examples. Can be found in JASON - HOUSE OF INNOVATION AND CREATIVITY's blog article Fantastic long exposure photos. Used in The Brown Study blog 2008 Retrospective. Featured in TheFutureBuzz's article50 Inspirational Images From Flickr Under Creative Commons. 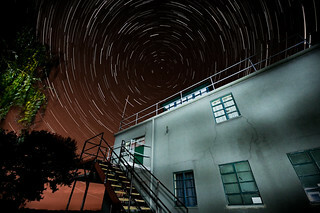 Featured in RRut.com's feature Star Trails: 10 Impressive Photographs. Featured in the "i tell stories" aricle On Creation: A Quarterly Report - A commitment to learning. Featured in the WebUrbanist's article 12 Long-Exposure & Time-Lapse Photographers. Featured in Mr. Topp and the Big Bad Blog's article The morning coffee is all knowing and evil. Featured in the Slog article Sideral. Used in the Environmental Graffiti article Star Trails: Secret Paintings of the Night Sky. Featured in Photo Tuts+ piece 50 Captivating Slow Shutter Speed Photos. Featured in Smash!ng Apps piece 45 Breathtaking Examples of Slow Shutter Speed Photography.